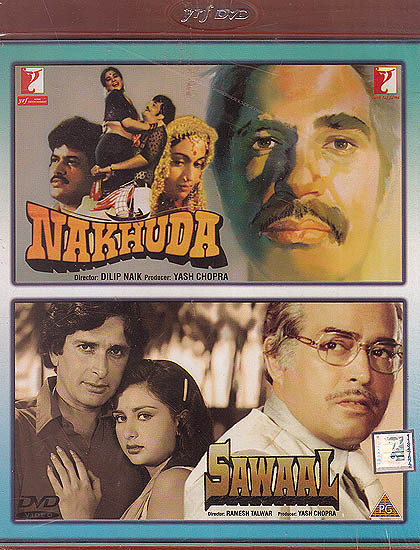 Yet another memorable film form the Yashraj Films Nakhuda is the story of how in the darkest despair booms the sweetest flowers of love and hope. For Ravi (Raj Kiran), despairing that he will never be able to pay off his debts, hope was in Shaikhoo Dada (Khulbhushan Kharbanda) who lends him the money and what Ravi gives Shaikhoo in the Way of love and affection is something that no amount of money can ever pay back. More flowers of happiness bloom as Ravi gets a job and marries Sonia (Swaroop Sampat), the daughter of the wealthy seth Jagannath (Madan Puri). As Ravi gains success, he never forgets the man he worships, Shaikhoo. But Seth Jagannath cannot accept that his son-in-low should hold and illiterate, poor man as his God and slowly begins to deviously sow seeds of dissension between Shaikhoo Dada and Ravi. Shaikhoo Dada realizes this will tear Ravi’s world apart starts deliberately creating circumstances where Ravi will lose all respect for him. And where once there was worship, now there is loathing. Will Ravi ultimately discover the truth, will he once more find his God? Seth Dhanpath Rai (Sanjeev Kumar) is the country’s most powerful smuggler, surrounded by his fortress of power and money. Till one day, his daughter Sonia (Poonam Dhillon) falls in love with Ravi Malhotra (Shashi Kapoor), a police officer and wants to marry him. Dhanpath Fai realizes that his son Vicky (Randhir Kapoor) has taken a path that goes against the one he walks. That is when the question begins to haunt him- What is more important? His children’s happiness or what he is which gives him so much power and money. Will Dhanpati Rai’s question be answered before it’s too late? Will find life’s true wealth? Sawaal is a powerful confrontation of life’s greatest motivating forces-self against selflessness, love against power, good against evil-presented in great performances by acting legends like Sanjeev Kumar, Waheeda Rehman and the rest of cast and supported by khayyam’s melodious score. Sawaal is directed by Ramesh Talwar in the tradition of Yash Chopra’s films.